Lovely nails start with lovely hands. Seriously...do you see many manis that don't come with soft cuticles? Getting there takes a little extra time on your part, but not much. And with a helpful product, you'll find it much easier. 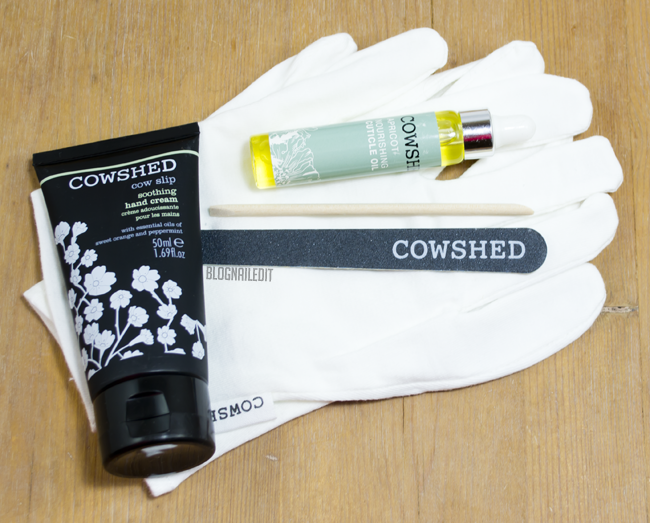 The Cowshed Manicure Maintenance Kit is perfect for this. I love this little kit. It's a fly-friendly pack with an emery board, cuticle stick, some apricot oil, Cow Slip hand cream, and a pair of cotton gloves. The hand cream smells lovely. It's infused with sweet orange and peppermint oils, so it's soothing but revitalizing. The texture isn't heavy like a body butter, but not air light either. It's a great texture to apply right after washing your hands, or over night. Pair the cream with the cuticle oil and the cotton gloves for additional night time luxury. The cuticle oil is a thick oil, similar to olive oil. It doesn't smell anything like apricots to me, but it does smell nice - more like roses than fruit. Because it's a heavier oil, I wouldn't recommend it for day time use. I slathered my cuticles with small drops before bed and really loved the condition of my cuticles when I woke up. The color on my nails is OPI Don't Bossa Nova Me Around. This kit is available through the Cowshed site for $30. The kit will last quite a while, so don't be sticker shocked! These products were sent to me by BPCM & Cowshed. The reviews are based entirely on my experience with the products and were in no way influenced by anyone. I love the OPI shade you're wearing, it's flattering on your nails! I can't say I'm sold on a $30 manicure kit, especially when the hand cream is only 1.7 oz. The packaging is cute though!